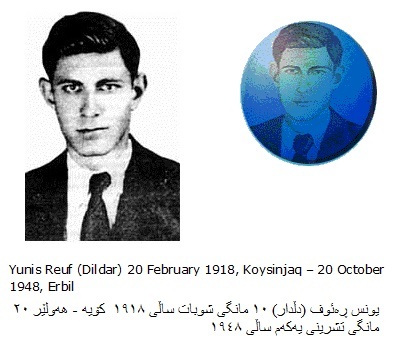 Yûnis Reuf (10 february 1918 - 12 July 1948) known as Dildar, was a Kurdish poet and political activist. He was born on February 20, 1918 in the town of Koi Sanjaq ( Koya) located Arbil Governorate in Suoth Kurdistan. first he started school at Ranye. After finishing high school in Kirkuk, he moved to Baghdad, where he studied Law. in 1945 he finished law school. He wrote Ey Reqîb (Kurdish national anthem) in 1938, when he was in prison.The title ("Hey Guard") has been said to be written about the guards in the prison where Rauf was imprisoned at the time for his political beliefs. It was originally written in Soranî dialect, but was later translated into Kurmancî dialect for those Kurds living in the areas (eastern Turkey, north-eastern Syria, Armenia) that speak that dialect. Its use as an anthem for the Kurdish people started soon after its original composition, and was a natural choice for the national anthem of the short-lived Kurdish Republic of Mahabad (a self-proclaimed Kurdish nation in western Iran; created in early 1946, but forcibly incorporated back into Iran later the same year.) Upon the close of the Gulf War in 1991, the Kurds in Iraq obtained greater autonomy "Ey Reqîb" grew in those areas; the KRG has proclaimed it the official anthem in South Kurdistan/northern Iraq.